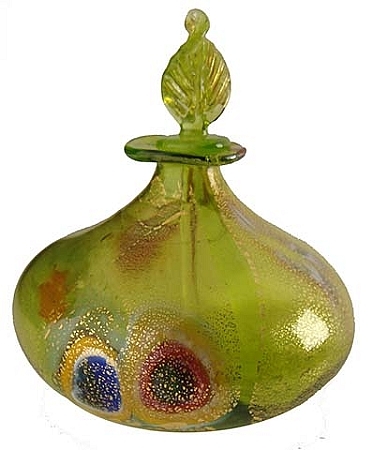 The light-catching effect of the 24 karat gold foil on the exterior of this herb green colored Murano glass perfume bottle combines with the slices of millefiori to create its exquisite look. Each bottle is handmade using traditional techniques and as such, may vary slightly. Approximately 3 inches wide at the base, reaching 4 inches tall with stopper. Also available in clear with gold and millefiori or all millefiori with gold.